No Comments, Holiday Cottages in Scotland, Holiday Cottages in the UK, by cottagewriter. Pitstruan holiday cottage, secluded luxury large self-catering cottage near the sea, Argyll. Bedrooms: 4 – 4 king, 2 with additional single beds. Sleeps: 10. Oban 4 miles. Pets welcome. This delightful, remote holiday home is on the shores of a sea loch and set in panoramic countryside. It offers superb accommodation for families holidaying together. There are fabulous beaches, great walking and lots to do and see nearby. Argyll is an idyllic area of Scotland and this holiday cottage is beautifully appointed and equipped. Bonawe House holiday cottage, near Taynuilt, Oban, Argyll, Scotland. Bedrooms: 2 – 1 double, 1 twin. Sleeps: 4. Oban 20 mins drive. No Pets. Located on the shores of Loch Etive in Argyll, on Scotland’s west coast is this luxury holiday accommodation in a spacious self-contained wing of a stunning 18th century Scottish house. Children are welcome to stay, and there is a games room with table tennis for them to enjoy. A boat trip up Loch Etive is a great day out – you can visit some very remote and wild parts of Argyll and watch the seals. No Comments, Holiday Cottages in the UK, Holiday Cottages in Wales, by cottagewriter. Llys Bilidowcar holiday cottage for 4, very family friendly, close to the beach, Pembrokeshire, Wales. Set in Pembrokeshire’s picturesque coastal village of Broad Haven, Llys Bilidowcar, offers luxurious, award-winning, comfortable and contemporary holiday accommodation – perfect for a family holiday. It is located in a peaceful area of the village yet is close to many activities and attractions. This marina style house has views of the sea and is close to the beach making it ideal for families as the property has everything you would need for young children. Equally it is suitable for two couples as it is beautifully decorated and an ideal base from which to explore Pembrokeshire. Rent from £275 per week. No Comments, Holiday Cottages in Scotland, by cottagewriter. Seaside Croft House, Loch Carron self-catering Wester Ross, Scottish Highlands. Bedrooms: 2 – 1 double, 1 twin. Sleeps: 4. Strathcarron. Short breaks on request. Pets welcome. Warm, comfortable accommodation in a beautiful location. Seaside Croft House has wonderful views of the Applecross hills and the Isle of Skye in the distance. It is a good base for touring the west coast of the Scottish Highlands. Enjoy local walks and abundant wildlife in tranquil surroundings. Come and relax and leave your worries behind, eat local produce, breath in the fresh air and watch the sunset – you will be made very welcome! Self-catering holiday cottage Lochgilphead, Argyll, Scotland. Bedrooms: 3 (1 double, 2 twins). Sleeps: 6. Lochgilphead. Pets welcome. Short breaks in the low season. Finchairn Cottage is set on a remote hillside commanding amazing views looking down to Loch Awe. It is completely off the beaten track. The cottage is fully equipped and comfortably furnished to a high standard with a large open fire. Finchairn is part of a hill farming estate called Ederline which offers fantastic walks, cycle rides, bird watching, fishing with boats and canoes for hire. Being near to the coast and the ferry ports it is an ideal base to explore the Islands. A perfect Scottish retreat! Key Cottage, Falkland, self catering in Fife, Scotland. Bedrooms: 3 (1 king, 2 twin). Sleeps: 6. Cupar. No pets. Short breaks on request. Key House is a beautiful cottage built in 1713 that nestles into Falkland Palace with which it is closely associated. This high standard, sympathetically renovated property retains many original features and is decorated in simple cottage style with antique furniture. Perfectly located for woodland walks, hill climbing, cycling and sites of natural and historic interest, it is only 20 miles from St Andrews and within easy reach of Edinburgh, Stirling, Perth and the highlands. Barr-Beithe Lower holiday cottage, Loch Awe, Argyll, Scotland, UK. Bedrooms: 3 – 1 double, 1 twin, 1 single. Sleeps: 5. Loch Awe. No Pets. Lovely holiday accommodation (all on one floor) on the edge of Loch Awe, with stunning views over the loch and hills. The cottage is a perfect base for exploring the gorgeous Argyll countryside and there are lots of activities and attractions in the area. Walking, fishing and pony-trekking are all on the doorstep, and the local beaches are fabulous. You can relax in the hot tub on the deck and just soak it all in! The Highlands of Scotland are the perfect location for an isolated holiday cottage. The stunning landscape is idyllic with lochs, glens, rivers, moorland and mountains., the countryside is unspoilt and varied. The Green House at Glenelg is one such holiday cottage – an exquisitely designed hideaway for two. Perched in a large garden the Green House is quite unique in so many ways! It has an amazing uninterrupted view over the sea to the Isle of Skye and is quite unique – just like the original Skye Ferry which still sails this ancient crossing, The Brochs, The Barracks, the famous War Memorial and Glenelg itself. Whether its adventure at sea, a relaxing picnic, fishing, bird watching, water sports or just a gentle walk along the beach, it is all possible when you check-in at The Green House. So close to paradise you can do as much or as little as you want to! Bespoke adventures at sea can encompass really quite a large stretch of coast, anywhere from Ardnamurchan to Applecross, from Kinloch Hourn to the Island of Rhum and include famous pubs, restaurants and hotels, for lunch, dinner or drinks or visit secret beaches, bays and islands for BBQs and picnics. Porpoises, seals, basking sharks, dolphins, humpbacks, minke whales, sea-eagles, otters and many other creatures are frequently sighted along the coast. The Green House is a perfect place to stay for honeymoon or a romantic break. Inside there is a four poster bed, a bath in a bath chest at the end of the bed, a wet-room, heated Italian stone tiled floor throughout, a small kitchen with eating area and a cosy wood-burning stove. The house is well equipped with a telephone, free WiFi, Sky TV and DVD. Outside there is a huge 14m deck with deck lights, a traditional wood burning Finnish hot tub and a large gas BBQ. This is simply the perfect place to relax and enjoy the amazing view. Well behaved pets only. Short breaks offered. 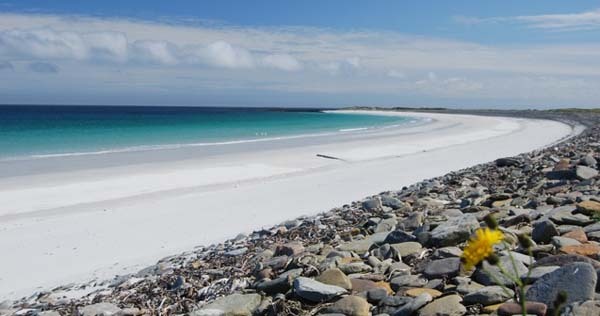 The Orkney islands lie just north of mainland Scotland and consist of over 70 islands, of which just 18 are inhabited. It is a very special and unique place to visit – with a magical atmosphere quite different from the rest of Scotland. The Orkney Islands are a bird watchers paradise and also home to amazing wildlife including grey seals and if you are at the right place at the right time whales, dolphins and porpoises are regularly and easily spotted! Neolithic, Bronze Age and Viking ancient monuments are all over the islands with the most famous being Skara Brae, Maeshowe and the great stone cirles at Brodgar and Stenness. Holiday self-catering accommodation on Orkney varies from 5 star cottages to traditional crofts. Renting a holiday cottage on Orkney is fabulous whatever the time of year – it is an enchanting place for a winter short break as well as for a summer holiday. Imagine sharing gorgeous white sandy beaches with no one, no traffic lights, 9 holes of golf on a 2600 yard course for just £5 including hire of clubs, trout fishing, watching seals from your back garden and LOTS of fresh air. Sounds like a great way to spend a family holiday? We have just the place to recommend! Which Cottage approved Kiln Barn on the Isle of Sanday is a fascinating Holiday home if you are planning a holiday on Orkney Isles. The Barn sleeps six and Pets are welcome too! – Fly to Kirkwall with Flybe from all the main Scottish airports. – Take a boat from Aberdeen or over from the north east mainland. – The drive or train journey to Thurso is through some of the most beautiful landscapes in Scotland and then you take a ferry across the Pentland Firth. – There are lots of ferries and local flights to the smaller Orkney islands. No Comments, Holiday Cottage News, by cottagewriter. Late-Availability-Cottages.com showcases holiday properties that have vacant weeks due to last minute cancellations or weeks that have been unfilled for a variety of reasons. Click on the image below for details of fantastic last minute Holiday Cottage deals this week-end!